Sunday night’s mega-50th anniversary edition of the Academy of Country Music awards ceremony had a resounding twang in the D-FW Nielsen ratings. Originating from Jerry’s Palace and setting an all-time attendance record for an awards ceremony, the bigger-is-better ACMs averaged 732,270 viewers on CBS and 239,689 in the advertiser-coveted 18-to-49-year-old demographic. That blew past the previous April’s ACM shebang, which had 411,875 viewers and 153,065 in the 18-to-49 range. The ACMS also drew a far bigger crowd than the arch rival Country Music Association awards, which long have been seen as the industry’s gold standard. 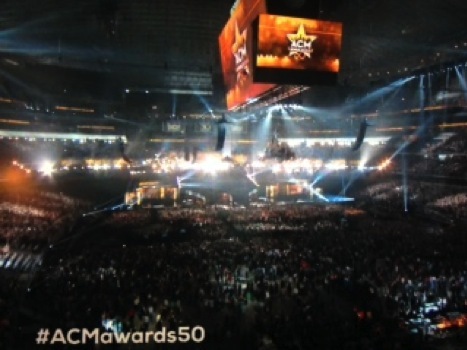 Last November’s CMAs on ABC averaged 488,180 total viewers in D-FW, with 151,382 in the 18-to-49 motherlode. Sunday night’s ACMs, which ran from 7 to 10:30 p.m., included appearances by current Dallas Cowboys Tony Romo and Jason Witten plus Cowboys’ Hall of Fame quarterback Troy Aikman. The announced in-house crowd was 70,252. Many of the ACM winners thanked Jesus Christ for their success. NBC’s biblical epic, A.D. The Bible Continues, made it a doubly big night for JC by drawing the biggest overall crowd opposite the ACMs. A.D. had 167,376 total viewers in the 8 p.m. hour. That was more than twice the audience for any other competing network program. Let’s move to Saturday night, where the Dallas Mavericks’ loss to Houston in Game 1 of their Round One playoff series was shown on both TXA21 and ESPN. It tipped off at 8:41 p.m. and ended at 11:12 p.m.
TXA21’s homegrown telecast averaged 146,454 total viewers while ESPN edged a little higher with 153,428. The national telecast outdrew TXA21 by a wider margin among 18-to-49-year-olds -- 91,460 viewers to 66,230. On to Friday night, where CBS’ two-hour edition of The Amazing Race led all prime-time programming with 174,350 total viewers. It also was the top draw among 18-to-49-year-olds. Here are Friday’s local news derby numbers, with the May “sweeps” getting off to an early start this spring with a Thursday, April 23rd launch. Fox4, NBC5 and Gannett8 tied for the most total viewers at 10 p.m., but Fox4 won outright with 25-to-54-year-olds (main advertiser target audience for news programming). Fox4 had a big day all around, sweeping the 6 a.m. competitions as usual and adding 5 and 6 p.m. wins in the 25-to-54 realm. The station also tied NBC5 for the most total viewers at 5 p.m. while Gannett8 ran first in that measurement at 6 p.m.